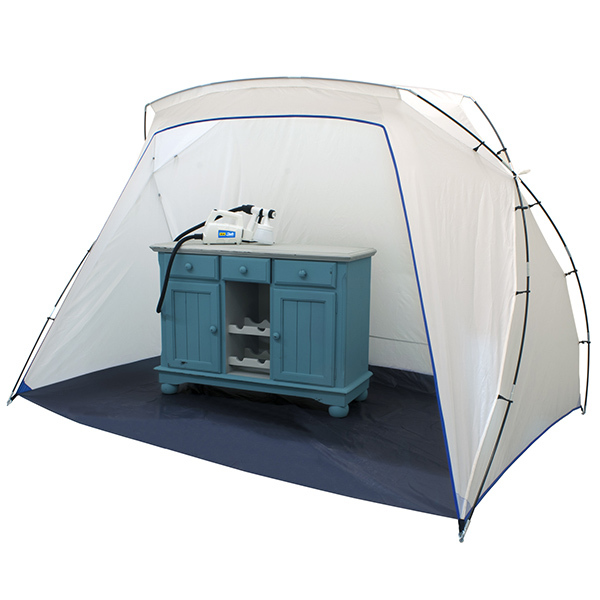 The Wagner Studio Spray Tent is the perfect addition when spraying all your upcycled furniture and craft projects. Painting inside your house or outside in the yard, the Studio Spray Tent contains the paint overspray keeping your work area clean while keeping dirt and leaves off your drying project. Paired with a Studio Series Sprayer you will finish projects faster with no brush marks, getting you the finish that you want. 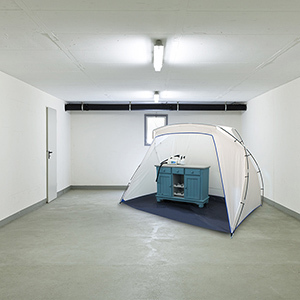 Get your paint spraying projects done anywhere with fast cleanup using the Wagner Studio Spray Tent. 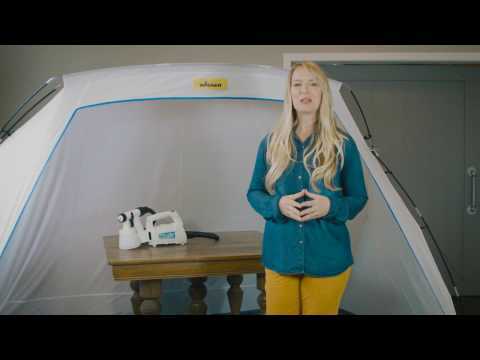 Wagner Spray Tent is rated 4.8 out of 5 by 5. Rated 5 out of 5 by MuddyBass from Awesome Product Purchasing this spray tent has allowed me to continue my projects in the Winter Months here in Iowa. I am able to set it up quickly in my garage and paint or spray finish with out the worry of over spray and all the inconveniences that come with it. 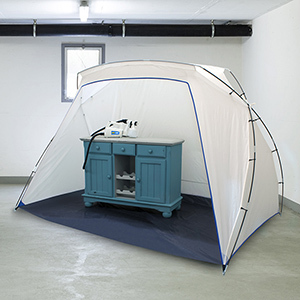 Rated 5 out of 5 by Brissonte from Great spray tent We are moving into a new larger retail space next month and this tent is going to be the perfect addition to our painting studio. We can paint indoors without worrying about paint spray or if the weather is bad. Definitely going to be a big help! Rated 5 out of 5 by Frank Maz from Perfect Accessory I did not think that I would need a Spray Tent. After using it, I was amazed how much the tent protected my work and prevented overspray. Definitely a great tool to have. Rated 5 out of 5 by PeterD from Works well I was skeptical because it didn't look tall enough. Weather turning cold and needed to move my top coat spraying operation in doors. Set up was a little clunky as the shock-corded rods are very long. However, it went together fairly quickly. The white tent portion lets in needed light without shadows. I had no problem top coating a disassembled bistro table project. Does this paint tent comes with or can you order a front flap-cover that goes down to the floor? We do not have a front flap for our spray tent. I see that the floor is &quot;liquid resistant for easy cleanup.&quot; Does the inside of the tent need to be cleaned after each session, or do we just allow the stain/paint/polyurethane overspray to dry and accumulate? It is not a requirement that it be cleaned. Some accumulation should be expected. In any case your project should be supported away from the tent material by wood blocks or other arrangement. For more tips and tricks call technical support at 800-328-8251. Yes it has a carry bag that comes with the tent for storage. It does, made of the same material as the tent. is there an opening to exhaust the overspray? The front side of the tent is open so that the area is well ventilated. Feel free to call us at 1-800-328-8251 if you have further questions. You can also find more information and watch a video at this link, https://www.wagnerspraytech.com/products/paint-sprayers/spray-tent/.